On July 4, 2011, I posted an article on this website regarding a relatively unknown twentieth century Italian modern impressionist painter. 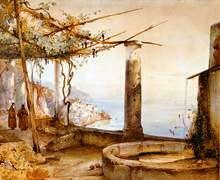 His name is Signore Costantino Proietto, but he signed his paintings “CProietto”. In our article, we mused about our C Proietto original oil painting and asked anyone else who owned one or had information on C. Proietto or his painting to please contact us and provide an image of his or her artwork. 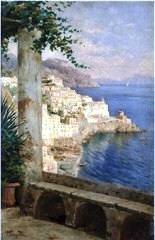 Three days later, Marion Grayson of Belton, Texas sent us the image of the Amalfi Coast painting shown at the top of this article. American relatives of Marion Grayson lived in Italy in the mid-1950s and they purchased her painting while there. Please click on the image for a larger picture of the Marion Grayson painting. When compared to my CProietto original oil painting, the similarities are striking. Although some architectural may differ, both paintings feature a single potted plant beneath the pergolato, with a view to the sea. Each painting, however, shows a different perspective; mine includes a view to the Amalfi Coast, and Ms. Grayson’s looks out to sea. Both feature afternoon sun and clouds rising from the horizon, rather than floating above. 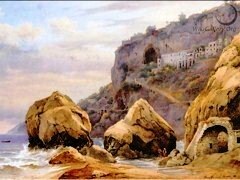 During my research, I discovered the name of the place from which Costantino Proietto painted the Amalfitan Coast. In Italian, it is the “Amalfi dal Convento dei Cappuccini”. In English, we call it The Capuchin Convent of Amalfi. Although no evidence of the fifth century chapel originally built on that site exist today, the foundation of the original monastery dates to 1212 CE. For the following 650 years, various orders of the Catholic Church owned and used the property. In 1882, the interconnected buildings and grounds became the predecessor to the Convento di Amalfi Grand Hotel. In 1899, the property experienced a catastrophic landslide, destroying its original cave and some early buildings. Over the next century, reconstruction occurred in many phases, culminating in 2002. Today, the "hotel dei Cappuccini Amalfi" combines enticing luxuries, such as an infinity pool and al fresco dining on the terrace, yet the beauty and tranquility of the original site remain for posterity. Beginning in the 1870s or 1880s, artists of note painted seascapes and landscapes, both from the terrace itself and from locations, below and around the property. Notable among them were Italian artists Giacinto Gigante (1806-1876), Carelli Consalvo (1818-1900) and Hermann David Salomon Corrodi (1844-1905). Austrian artist Franz Richard Unterberger (1838-1902) and Danish artist Carl Frederik Aagard (1833-1895) also painted stirring scenes of the monastery and the Mediterranean Sea beyond. Italian photographer Carlo Brogi (1850-1925) captured scenes from the terrace, which appeared on postcards as early as 1904. It was during the mid-twentieth Century that Costantino Proietto stood many times upon the well-worn stonework of the old terrace, painting that classic scene, always from a new perspective. It is rare in our world to find a place that retains its classic charm over hundreds of years. Destruction and reconstruction in and around classic monuments of the past may leave the monuments themselves in place, but rarely do the surroundings retain their original character. 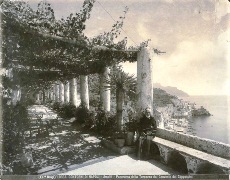 Even since C Proietto’s time, the terrace of the Convento di Amalfi Grand Hotel has changed, yet its columns and pergola echo the 1880 or perhaps the 1580 feeling of that place. Even today, the contemporary coastal scene, oft painted by the masters of old, retains the look and feel of the original place. 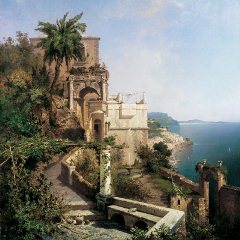 During our research into original oil paintings by C Proietto, we located or received new and heretofore unpublicized scenes of the Amalfi Coast. One is from Marion Grayson, as mentioned above and another is from the Italian Wannenes Group, and its Art Auctions website. 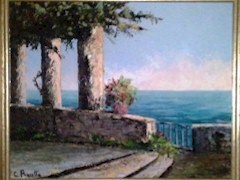 Each clearly shows the unique signature of my favorite Amalfi Coast artist, twentieth century Italian Modern Impressionist, Signore C. Proietto. Although his art becomes better known to the world each week, biographical information regarding CProietto is still scant. If any reader knows more about him, please contact me with the information. Once verified, I will be happy to provide attribution, as requested by the contributor. When I was young, I remember seeing a realistic copy of the sculpture, Michelangelo’s David at the Los Angeles County Museum of Art. As David spoke to me across the centuries, his magnificent grace and power struck me. Viewing that sculpture at age ten changed what I believed art could be. In that spirit, I am now writing a parallel art mystery story using my superhero comic characters, Moabbey, Coney, Kokopelli and Silver Girl. You will find them at my website, JimMcGillis.com. Join me there for the exciting story, and be sure to tell the kids. By kathleen griffin on June 7, 2018 08:47 AM | Link to this comment.